Home Our Work Stefan, The Marathon Man! 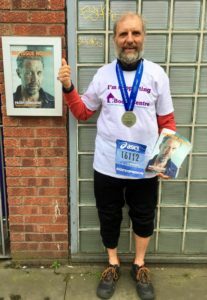 We would like to congratulate Manchester Victoria vendor, Stefan, who recently completed the Greater Manchester Marathon. Stefan raised funds for the Booth Centre and completed the course in 03:32:57. This meant that he finished 66th in his category! But Stefan isn’t stopping there. On May 20th, he will participate in the Great Manchester Run to raise funds for Big Issue North Trust! Best of luck Stefan, we’re all cheering for you! If you would like to help Stefan hit the fundraising target to support the work of Big Issue North, please donate here. If you have been inspired by Stefan’s efforts, and would like to see how you can make a difference to the lives of Big Issue North vendors, please click here. Interact: Responses to Stefan, The Marathon Man!